Plantain is one of the most versatile herbal medicines. We can use the leaves, seeds and roots but I will focus on the use of the leaves in the post. Most of you will have come across it. 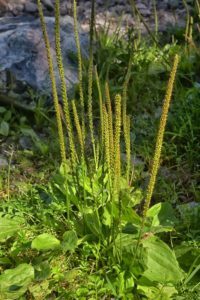 Most commonly around here we find broad-leaved Plantain (Plantago major). The plant grows along waysides, in gardens, lawns, pastures, meadows and cultivated fields. The leaves are very broad ovate and surround the stem in a basal rosette. Plantain, just like so many other so-called weeds, is rich with nutrients including vitamins A, C, K, zinc, iron, calcium, magnesium, potassium, phosphorus and silicic acid. Remember that the nutritional value of any (edible) plant depends greatly on the soil it is growing in. Silica promotes tissue repair, in this case specifically in the lungs. Zinc enhances immune system function. Plantain also contains mucilage. Mucilage has a soothing effect on any tissue. Internally Plantain is primarily used for any respiratory tract challenges, it restores the lungs and helps to expel mucous. It is helpful in conditions such as coughs including nervous cough, bronchitis, lung infections, allergic asthma and any other congestion incl. sinus and ear infections. I always have a jar of dried leaves on hand in the winter for my grand children. As a tea it can also be useful in cases of urinary tract infections or simple irritation. Internally and externally it is a great wound healer for sores, cuts, scratches, dog bites, ulcers and burns. Applied as a poultice it provides instant relief from insect bites. Chew on a few leaves to get the juice from the plant flowing and apply directly to the irritated area(s). It is amazing how good this feels. Plantain has many more usages but these are the most common ones. As food you can add some leaves to the Jungle Juice or salad, use as spinach (cook only for a few minutes) or as a potherb. The younger leaves are preferable to older ones. And of course, you can make an herbal tea from the leaves as well. I highly recommend that you get out there, harvest this miracle herb and add it to some of your dishes. But not only this, make sure you dry some for use in fall and winter in case a nasty cough gets hold of you.